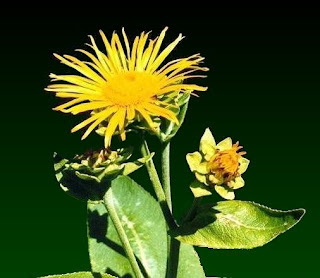 Elecampane, it has everything great! No winter without elecampane in closets. It is indeed one of the most useful plants for lung infections, particularly in the productive phase of bronchitis, that is to say when there is expectoration of mucus. During bronchitis, your lungs will work hard to constantly cough up the waste produced by the immune system. The expulsion takes the form of mucus. Late in the infection, the lungs tired sometimes struggle to keep up the pace, especially as mucus thickens. Bronchitis drags on, which can cause a relapse. Insert so the elecampane once your cough becomes productive. Take the form of decoction by forcing you to drink a hot liquid, making it the most good. Besides being expectorant, it acts as a disinfectant bronchial, eliminating the passage pathogens present. It is also bitter, and any bitter has a tonic effect on digestion. What it does we interested? During bronchitis, mucus is swallowed, especially at night. This mucus, high protein must be digested at a time when digestion is idling. The elecampane will lend a additional inch. I advise you to continue to take a week after symptoms to ensure a good resolution of the infection. The Elecampane grows easily from seed. Plant them in the spring in a trough provided for this purpose. The seeds need light to germinate. Tamp the soil well, sow them in surface and then pack it well again, extremely important step to fully fix. Warning, do not cover them with soil. Keep moist by using a vaporizer. The seeds should germinate after about ten days. Transplant the young seedlings in the bucket, and then pass it in the ground as soon as it is strong enough and the roots start coming out of the bucket. Space the plants about 70 to 80 cm. Work the soil with good compost or composted manure shovel to make him a good start. The elecampane appreciate a wetland, it will be necessary to water it regularly. It will also have a land that drains well (that does not retain too much water, so more sandy qu'argileuse). Plant it is in full sun, partial shade or partial sun. The aerial parts die during the winter and the energy goes back into the roots. In late autumn, cut and clean the leaves and large dry stems. You can crush the leaves and place them at the foot of the plant for use as mulch. The elecampane is relatively resistant to cold. At the end of the winter, spread a good layer of compost, and then you will see pinkish bloom shoots from the roots, which give birth to new leaves. The flower produces a large quantity of seeds, which can be used to renew your plants. Nevertheless, the spread is much more easily by dividing roots. Harvest root when the aerial parts have disappeared. It is best to wait until the second year, although it happens to me out a seedling when I have no choice. Pick when the ground is wet because the root mass is difficult to pull and it would be a shame to leave some in the ground. If the weather is dry, you can clear one or two sprinklers on the plant and then harvest the next day. Please have a spade fork to uproot the plant. Shake the bulk of the earth. You should see several "eyes" on top. Break some of the root mass containing at least one eye and gently replant this part so as not to sacrifice the plant. The other part will be for your consumption. Wash the roots with water, using a brush couch. You can break it into chunks for easier cleaning. First dry on a cloth, then in dry sections. Do not cut the roots into small pieces, because the plant contains aromatic components which will oxidize on contact with air.